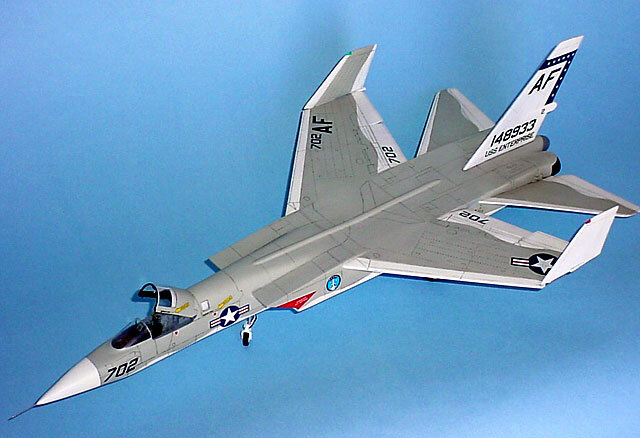 Developed during the late 1950’s, North American Aviation’s A3J Vigilante was designed to fill the Navy’s requirement for a high-speed nuclear bomber, replacing the A3D Skywarrior in the heavy attack role. The resulting design was a tandem-seated, sleek-looking aircraft with cutting-edge technology, such as a linear bomb bay and one of the first operational HUD’s. The Vigilante reached fleet squadrons in 1962, deploying aboard the USS Enterprise with VAH-7 Peacemakers. The next squadron to receive the A3J was VAH-1 Smokin’ Tigers. Soon after entering fleet service, Secretary of Defense Robert McNamara instituted his idea of commonality, a part of which including changing aircraft designations to the Air Force style. The A3J became the A-5A. However, A-5A’s were not to be seen in service for very long. Problems with the linear bomb bay were never satisfactorily solved, and it soon became apparent that the mission for which the Vigilante was designed couldn’t be fulfilled. NAA, sensing that this was the case, began an upgrade to the original design, adding fuel cells in the fuselage and integrating a reconnaissance “canoe” under the belly of the aircraft. The Navy bought into the idea, and the RA-5C, which would equip squadrons for more than a decade, was born. Only 2 fleet squadrons ever flew the A-5A in its original attack configuration, although the RA-5C still kept that ability. It also made only 3 cruises on board a carrier. Most of the A-5A’s in service were returned to NAA to be converted into RA-5C’s, while a few others were used for high-speed testing. While not deemed a success as an attack aircraft, the Vigilante never the less was jump forward in aircraft design, and found its true calling as a recon platform. 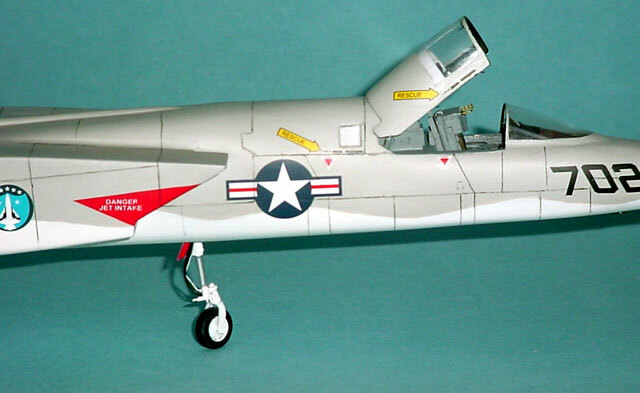 For years, modelers have wanted a 1/48 Vigilante, myself included. The idea for this project occurred about 5 years ago when I browsing through a hobby shop and looked inside the box of a 1/72 ESCI Tu-22 Backfire bomber. It struck me that the lines of that aircraft were very similar to the A-5’s, including the placement of the rear window. I figured that no manufacturer would produce a Vigilante in the near future, so I decided to give it a try. 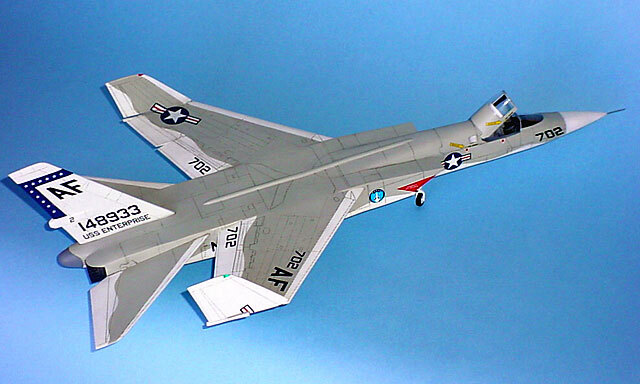 I chose the A-5A version because I figured that if someone DID actually come out with a model, it would be the RA-5C version. 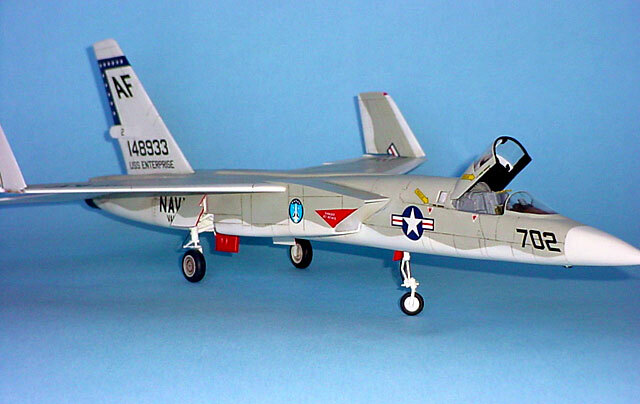 To make a long story short, I cobbled together parts from various models to scratchbuild my A-5. The entire front fuselage section and lower rear fuselage half is from the 1/72 ESCI Tu-22. The wings come from a 1/48 Mig-25, while the folded sections are the outer wings from a 1/72 Mig-25. 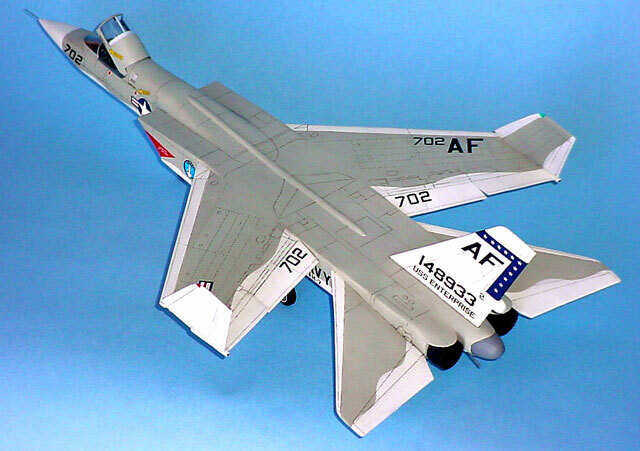 The windscreen is the rear portion of a 1/48 F-15 canopy, while the canopy comes from modifying an A-7 canopy. 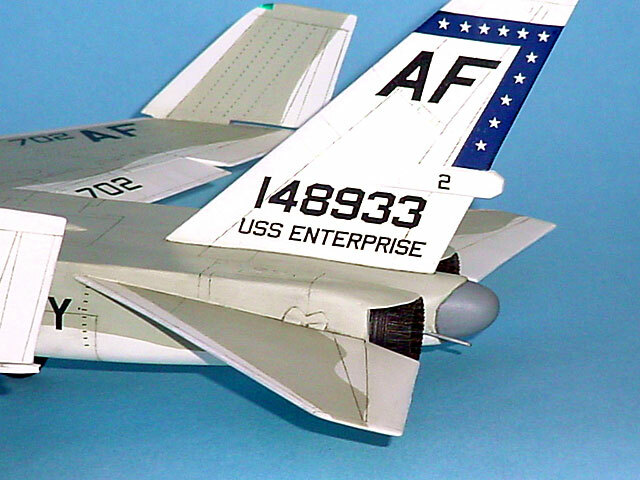 The intakes are modified F-14 intakes, the linear bomb bay cap is the nose to an F4D Skyray, the horizontal and vertical stabs are thick sheet styrene sanded to shape, the main wheel wells are from an F-8 Crusader, and the nozzles are from Aires. 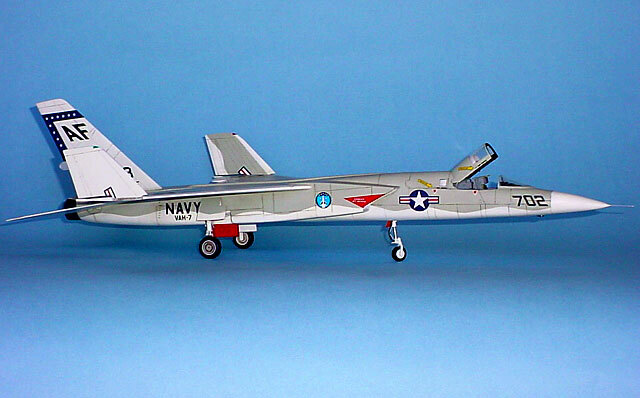 As for the landing gear, the front gear is a combination of A-4 and F7F gear with two outer halves of F-8 Crusader main wheels for the A-5’s front wheel. The main gear are modified F-14 and F-4 gear with F-4 wheel hubs placed into F-14 tires. The cockpit began life as an F-4 cockpit, but was heavily modified to at least get close to the A-5’s. Originally, I stuck a Martin Baker Mk. 7 seat in, but decided to scratchbuild a seat that more closely resembled the Vigilante’s unique seat. I had originally finished this project about 5 years ago in VAH-1 markings, but was never completely satisfied with the finished product. Over the years, my skills improved and I discovered better materials, such as Tamiya putty and Milliput. So, I decided to give it another go. I completely broke it apart, stripped as much paint and putty off as I could, and started over. This was both a blessing and a curse. It allowed me rescribe the panel lines in greater detail, but remnants of the old putty kept chipping off, making it difficult to get nice crisp lines scribed onto the surface. I did as much fixing as I could bear, but there are still some “soft” areas where the putty chipped away. The area that almost drove me to the nut house was the wing rivets. I drilled more than 800 on the surface of both wings. I don’t think I want to look at another pin vice for a very long time! In the end, though, it was worth the effort, because it looks much more realistic now than when I first finished it. I primed the entire model with Mr. Surfacer 1000, then sprayed Boyd’s White Primer for the white areas. The Gull Gray was Model Master Acryl. For the decals, I was able to get my hands on a set of Collect-Air RA-5C decals (thanks Rene) which provided me with the stenciling and unit markings. For the markings on the tail, I received a scanned image of Superscale’s old 1/72 sheet, which I used to make my own decals on a copier. For the life of me I can’t remember the name of the great guy who sent it to me, and the email was deleted, so whoever you are, thanks a bunch, and feel free to identify yourself! I don’t think this will ever win any awards, but this was by far the most rewarding modeling project I’ve ever done. At the very least, I have a 1/48 Vigilante in my collection. Now, on to the rest of CVW-6 aircraft!